Once upon a time there were three little pigs named Janet, Bernie and Hanz. 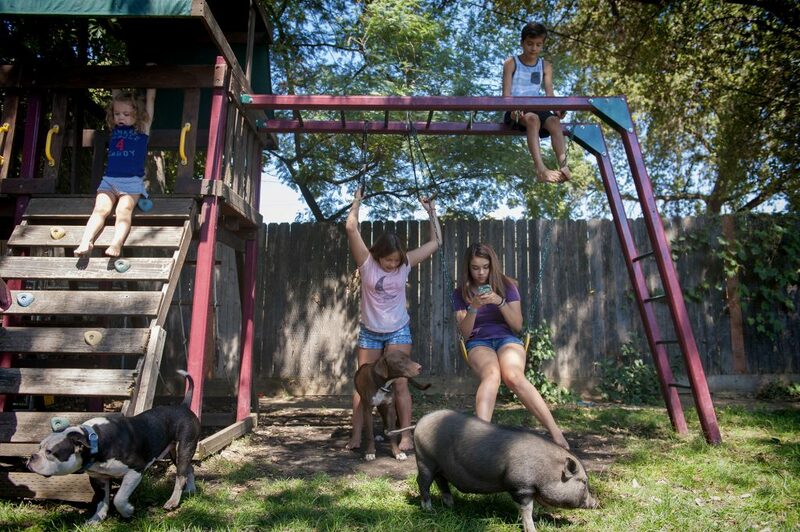 Their lives hit the jackpot when animal lover Cori Moore couldn’t stop dreaming of having pigs as pets. Adopted into the cozy home of Cori and Mike Moore, they are living like two kings and a queen being hand-fed grapes in the living room and cuddled and kissed by their kids. As a girl, Cori wanted to live on a farm and slowly, she’s bringing the farm to her family. Over the years, she has rescued dozens of dogs and cats. 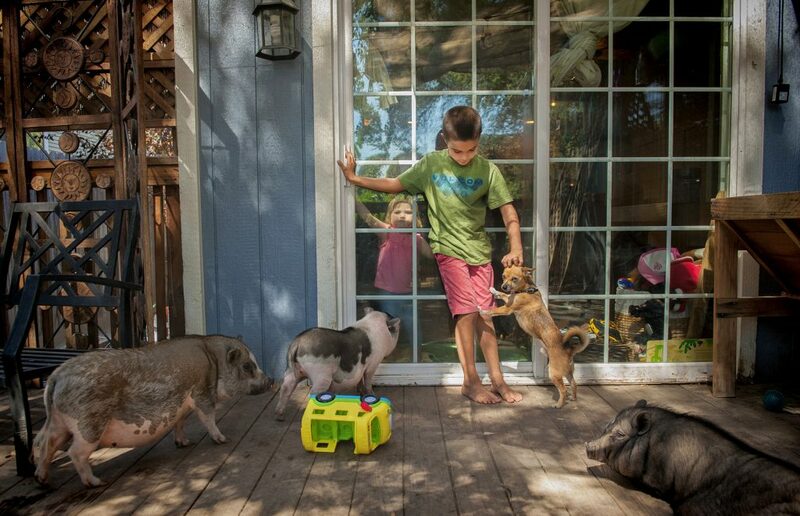 This year, she’s added the pigs to the mix where they relax with a pack of dogs and seven children ranging in age from 2 to 14 years old. Issaac pets Kitty-Pup while Janet, Bernie and Hanz hang out on the deck. Bernie, Hanz and Cali smell food and head to the kitchen in hopes of treats. Corie and Lily gives grapes to the pigs. Hanz gets some loving from Lily and Janet sniffs a toe. Bernie hangs out with the kids in the backyard. The Moore family loves their three little pigs. 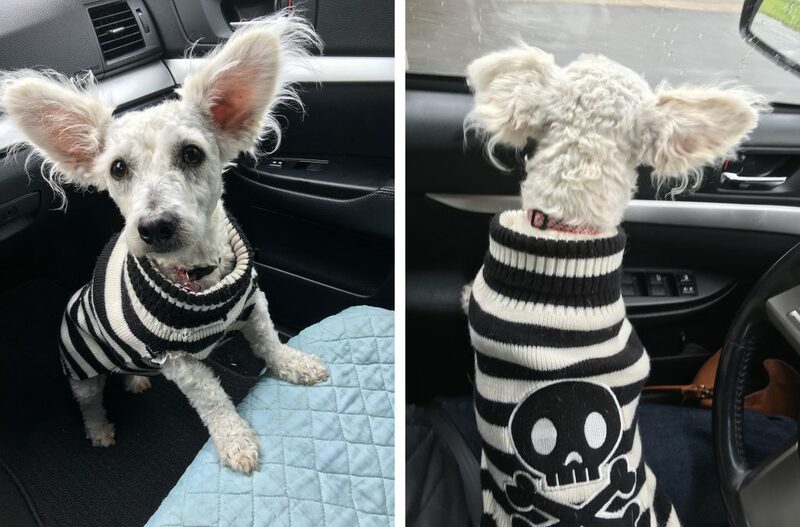 On March 20, 2016, I picked up small, scared, neglected dog from the Front Street Animal Shelter in Sacramento, CA to foster. He’d been picked up by animal control and no one came to claim him. Thank goodness. He was a mess. I thought I’d have him for a few weeks before he was ready for adoption. During the first week, he barely moved. I carried him to the yard, to the couch, to eat and to bed. Slowly, he timidly began walking around the house. In a month, he was trotting. It was Patty the poodle who sent him running, toward her. She lives next door, and he fell in love. Patty gave him a purpose, and he learned to walk on a leash so he could to follow her. He became more outgoing with her and her two siblings. He learned to ride in a car, went on his first hike, had a party for his dog friends and began playing with a ball. 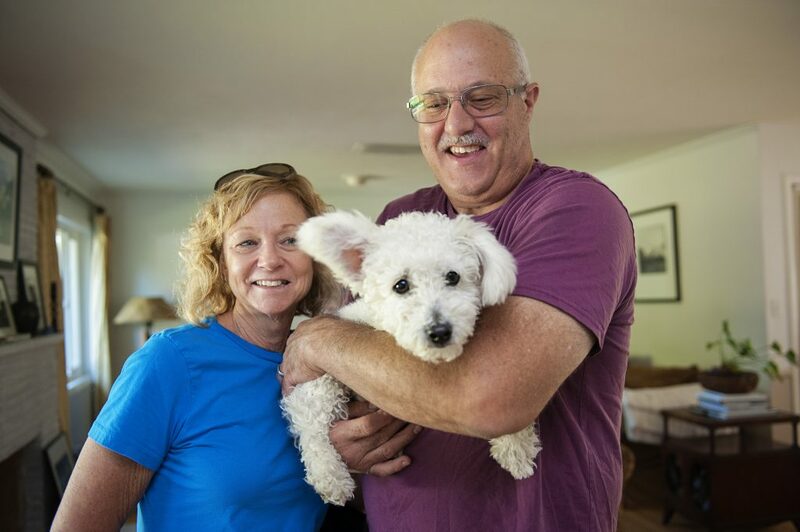 On Friday, Aug. 28, Finney went to his forever home with Lori and Mike Cox where he will have a playmate, Maggie and lots of love. 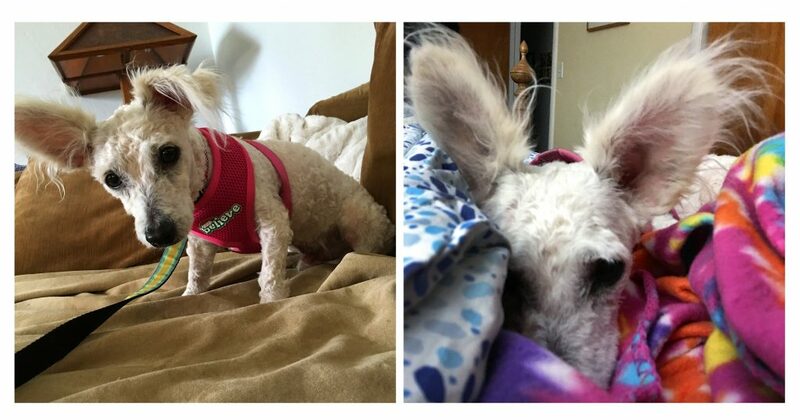 It is rewarding to help a traumatized dog heal and find happiness. As hard as it is to let them go, I know he is in good hands. Foster dog Finney’s intake photo. Finney was a sad pup his first days, but slowly he emerged from whatever had shaken him. He learned to ride in the car. 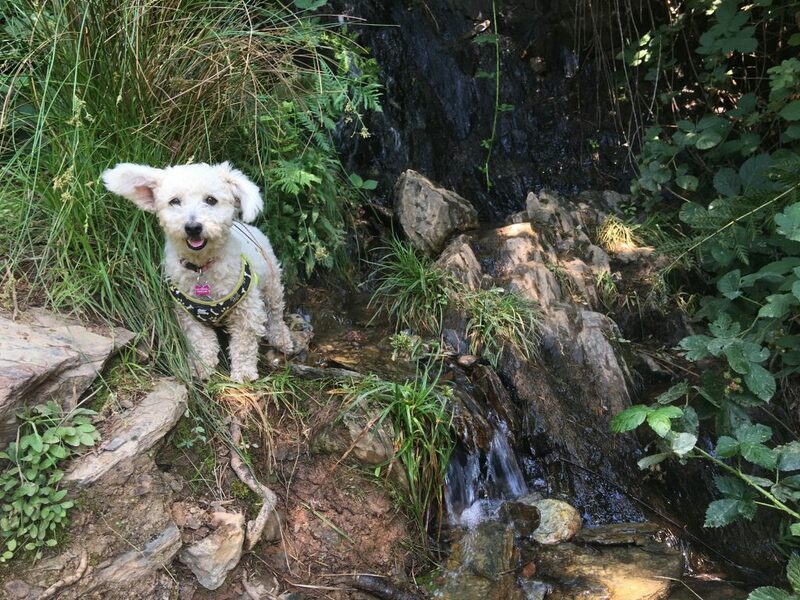 He went hiking and dipped his paws in a mountain stream. 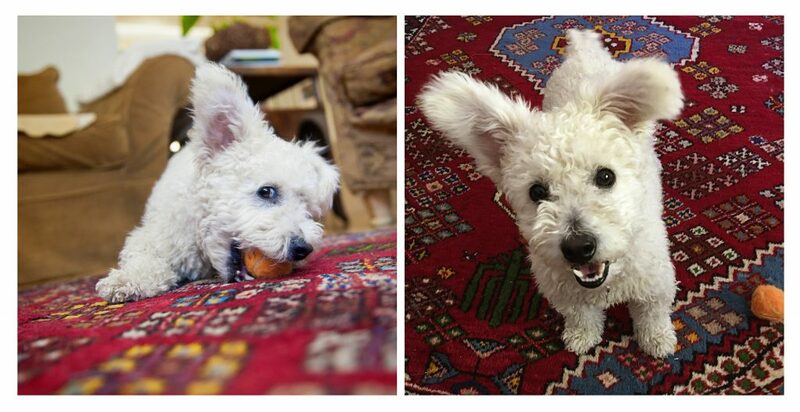 He was professionally groomed and was mistaken for a lamb. He met a girl. 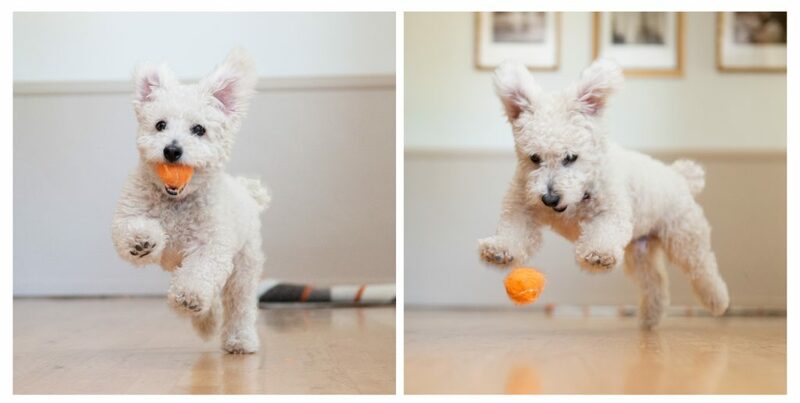 Patty the poodle lived next door and sent his head spinning. He followed her around like a lovestruck teenager. He was a good sport about getting a bath. He liked to keep his coat pearly white to impress Patty. 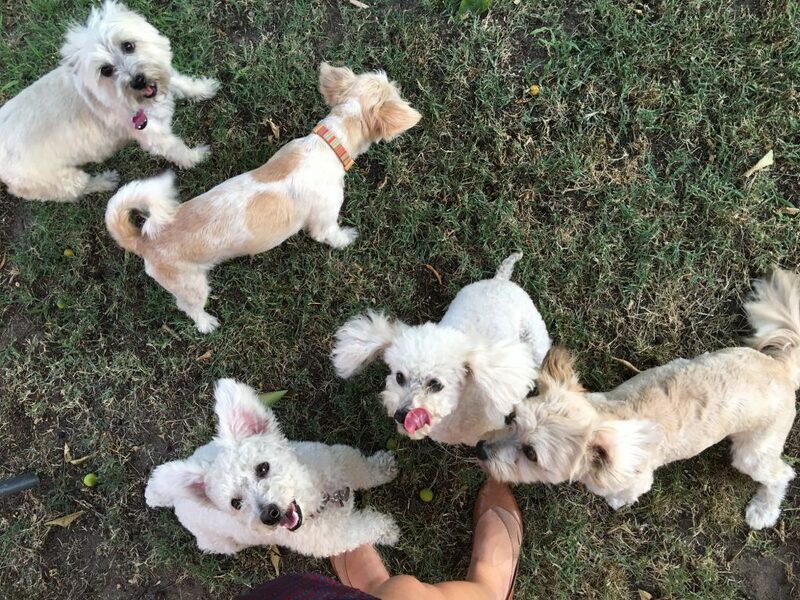 He made more friends and had a dog party! He invited only small white or tan dogs. He became a master ball chaser and so delightful to watch. Finney’s new family, Lori and Mike Cox, took him home on Friday, July 28, 2016. He’ll have a dog sister, Maggie, a Jack Russell Terrier, and they will be playing ball day in and day out. I’m sure he will make their hearts grow. To see more of my photos, please visit annechadwickwilliams.com and annewilliamsphotography.com. 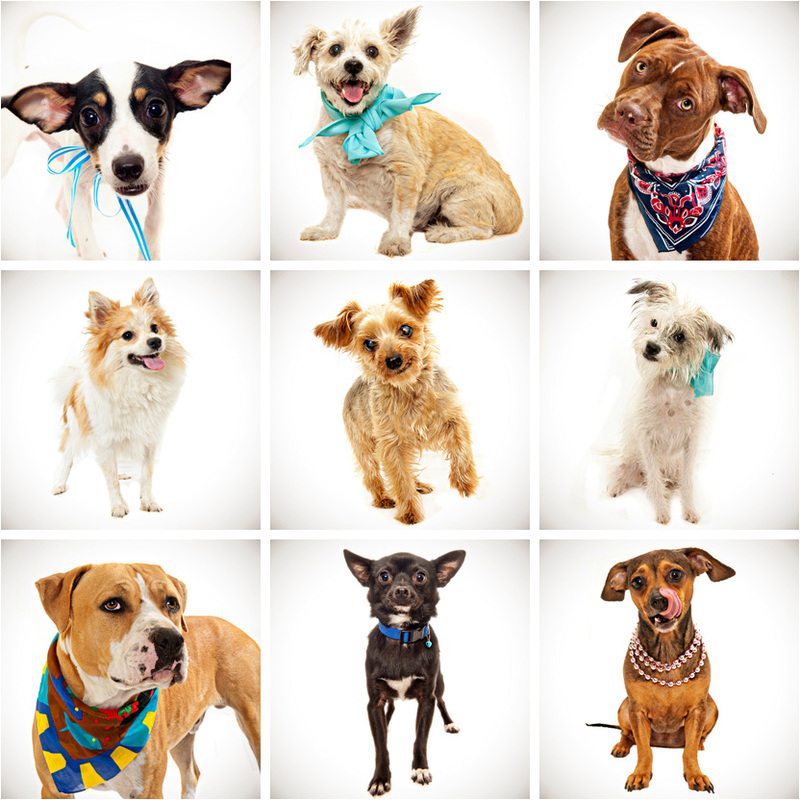 Meet the new cute crew at the Sacramento city shelter looking for new laps to curl up in. 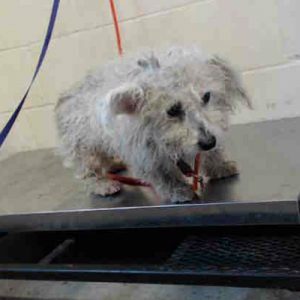 To see all the dogs that are available for adoption visit their website – http://www.cityofsacramento.org/generalservices/animal-care/adoptions/dog.cfm. Skedadle, Monte, Brianna, Romeo, Toby, Phyllis Dill, Matisse, Lt. Worf, and Coco are the latest fur set to land in the city shelter. From little dogs to senior dogs, this group is extra special. Sweet, silly, sad and gentle. It’s makes one want to scoop them all up and bring them home. More fun dog photos may be seen @ http://annechadwickwilliams.com. Love, love, love your dog pix. Thinking about a bday gift for my daughter in law who has 4 adorable dogs. Oh, it’s hot out here. 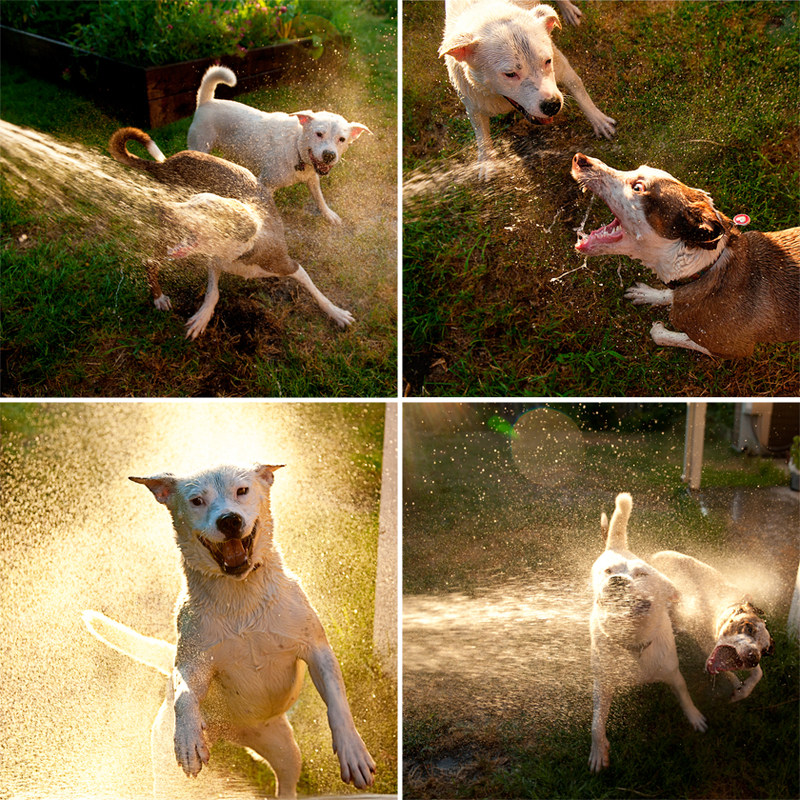 Time for some water hose action. Crazy Hailey keeps getting in my way and I’m circling, circling, circling, to get the best, direct shot of water down my gullet. Gulp. Gag. Circle, circle, circle, open mouth super wide, attack, OMG, the water is still coming. Time out. My esophagus is burning. That was a good one. Catch breath. I can’t get enough. Hailey is doing the high jump, blocking all the water. Boy, she has a lot of energy. This feels so good. Ahhhhhhhh. Are you thinking of adoption? 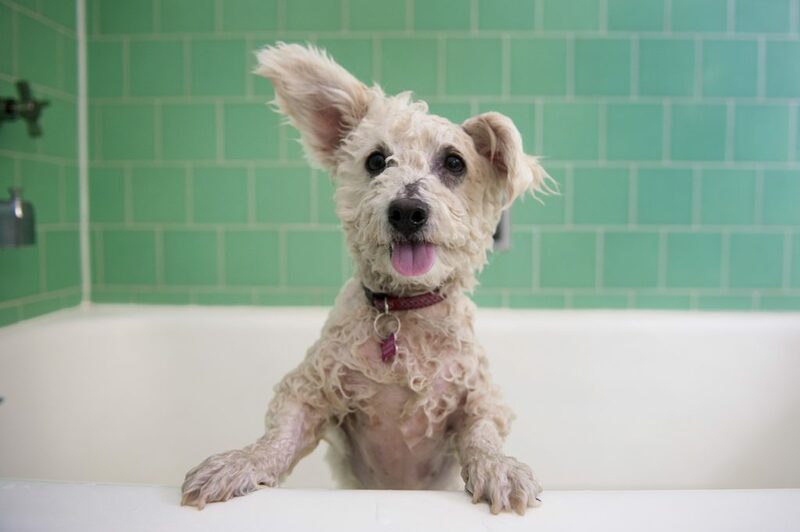 Meet Jelly Bean and Grommet, Maya and Bo, Sully and Roxy, some of the 63 dogs available for adoption right now at Sacramento’s city shelter on Front St. – http://www.cityofsacramento.org/generalservices/animal-care/adoptions/dog.cfm.